Universities face a limit on increasing student numbers for the next two years, with the threat of financial penalties for "over recruiting". In a letter to the higher education funding body, Universities' Secretary John Denham signalled a tough line on cash for extra students. The limit on expansion comes as student numbers have risen to record levels. 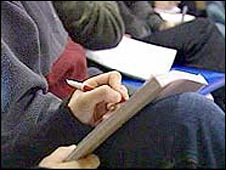 The Conservatives say the government cannot now reach its target of 50% of young people going to university. Writing to the Higher Education Funding Council for England, Mr Denham said the number of accepted applicants to full-time undergraduate courses had risen by 7% between 2007 and 2008. There were 442,443 accepted applications in 2008, up from 413,430 in 2007. Mr Denham said universities should eliminate "over-recruiting" in 2009, and to make other value for money savings. Over-recruitment could mean Hefce grants would have to be returned, he added. The result is likely to mean increased competition for A-level students, as more apply for university courses but the increase in the number of places fails to keep up. Overall funding for the sector would be increased by 3.2% for teaching, and 4.5% for research, the letter said. Mr Denham said that because of the freeze in additional student numbers, he was reducing funding for the coming year by £19m compared with his previous prediction. President of the National Union of Students, Wes Streeting, said a sustainable funding system was needed which would ensure more people could benefit from university. Universities UK welcomed the increase in funding for teaching and research, but said said it was "concerned" about the reduction in additional student places. "There is a danger in placing limits on growth," its chief executive, Diana Warwick, said. "Universities UK believes strongly that the UK's knowledge-based economy needs more, not fewer, graduates." The Department for Innovation, Universities and Skills originally estimated that universities could take 15,000 additional students in 2009-2010, but reduced this to 10,000 in October, after learning that many more students than anticipated would receive grants to help them pay for their studies. "Ucas has since reported that numbers of full-time accepted applications for 2008-2009 are at record levels," Mr Denham wrote. "I am now confirming you should not issue any further additional student numbers in 2009-2010." Mr Denham also says he is freezing the number of students for 2010, pending a review of the position. The annual grant letter to Hefce also sets out a number of other priorities. Science, technology, engineering and mathematics are identified as a key focus of research resources, and Dius is encouraging a growth in graduates produced in these subjects. Tackling climate change is also a priority. The Conservatives said it was looking unlikely that Labour could meet its target to send 50% of children to university by 2010. "These figures will come as a shock to sixth formers taking A-levels and diplomas, to people who want to upskill during the recession and to employers needing higher skills," shadow Universities' Secretary, David Willetts, said. "We cannot hope to emerge from the recession in a competitive state until there is a clearer strategy for higher-level skills."